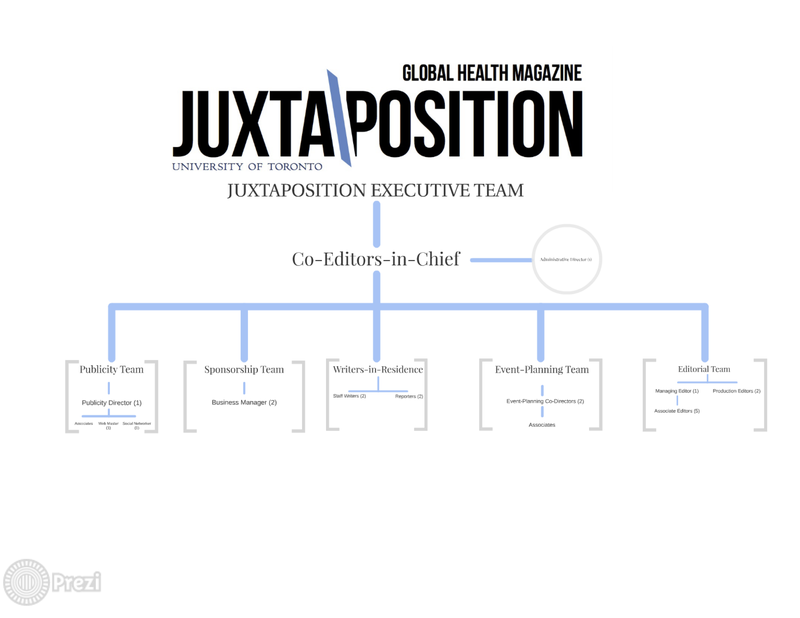 Editors-in-Chief (2 positions): Two members will direct the daily activities of Juxtaposition Global Health Magazine throughout the course of the academic year. One co-Editor-In-Chief (EIC) will work on editorial and production, the other will work on sponsorship, publicity and event planning. However, both are responsible for the outcomes of the magazine and events. Therefore, most tasks are not exclusive to one EIC and they would be shared between the co-EICs. Depending on the skills of each individual the responsibilities can be shifted between the co-EICs. Interview incoming interested members for various positions. Ensure that all actions are in compliance with the University policies and regulations as stipulated by the Juxtaposition Constitution. Engage in on-going rapport and updating with Co-Editor-in-Chief. Represents the organization at various community events, conferences, appointments with faculty and business meetings. Interview incoming interested members for various positions using the outlined interview process and documents. Sign all requests for rental of University space and equipment. At least one year previous work on the Juxtaposition Executive team. Devise a structures work plan along with the Editor-in-Chief and ensure all objectives are being met in a timely fashion. All activities undertaken and planned should be documented and updated. Time management, organizational and teamwork. Time Commitment: 5 hours/week; attendance to all general meetings recommended. Time Commitment: 3 hours/week; attendance at all general meetings recommended. Teamwork, communication, and strong follow through are required. Time Commitment: 3 hours/week (will increase during month of production); attendance to all meetings recommended. The Web Master will be responsible for maintaining and regularly updating the Juxtaposition website. Work with Publicity Directors to plan campus-based events to promote the magazine. Monitoring all finances of the Juxtaposition chapter and keeping the budget updated on the Excel spreadsheet along with the Sponsorship Director(s). Presenting bi-annual financial reports with a breakdown of all monies spent to the Editors-in-Chief. Highly motivated, networking, communication and strong follow through strongly required. Time management, organizational experience and teamwork. The Reporters will be responsible for reporting on events and lectures related to global health throughout the city. Participate in the magazine’s general meetings as well as attending weekly meetings with the editorial team or the Editor‐in‐Chief when required. Attend all Editorial related meetings organized by Managing Editor and Editor-in-Chief. Attend all appointments organized by Managing Editor and Editor-in-Chief (Editorial). Comply with Editorial procedure, deadlines and editorial review process. Experience with leadership, teamwork, and networking (resource utilization). Flexible schedule with interest in attending events throughout the campus. Previous writing experience is required. Must be a team player and communicate effectively with staff members. Time Commitment: 2 hours/week; may increase prior to and during month of production; must attend all meetings. (More intensive during times of production). The Staff Writers will be responsible for submitting engaging editorials to the magazine regularly, at least 2 pieces per semester per Staff Writer. Ensure that the articles are high quality, unbiased, and of significant value. Attend all appointments organized by Managing Editor and Editor-in-Chief. Seeking potential sponsors for the magazine outside the UofT campus. Soliciting people/organizations to advertise in the magazine, as a potential source of income. Devise a template of all organizations, and groups contacted to enhance the sponsorship documentation process. Strategize with Editor-in-Chief on which departments and student groups to target for collaboration. Soliciting other campus groups to advertise in the magazine, as a potential source of income. Work with the Editors-in-Chief and the Treasurer to assess the needs of the group, and brainstorm and develop a Sponsorship strategy and target groups to contact. Previous experience with grant writing and sponsorship is required. Strategize with Business Manager on which departments and student groups to target for collaboration. Update/create the production template for print and on-line versions of the magazine. Input editorial content and photos for publication under the supervision and direction of the Editors-in-Chief. Consider and incorporate feedback from Editors-in-Chief and Managing Editor. Mentor an associate Production Editor. Participate in the magazine’s general meetings as well as conducting regular meetings with the production team or the Editor‐in‐Chief when required. Ability to work on a stringent timeline and ensure drafts are completed by established deadline. Project planning and scheduling of the issues alongside Editor-in-Chief (Editorial), and Associate Editors. Provide leadership to Associate Editors, Copy Editor and in some cases, writers. Arrange meetings with all Section Editors as needed. Take a leadership role when establishing the call for writers. Setting up and facilitating editorial team meetings along with Editor-in-Chief (Editorial).. Initial screening submissions independently and along with Editor-in-Chief (Editorial). Engage in weekly meeting with Editor-in-Chief (Editorial) to update on editorial and production progress. Working alongside Editor-in-Chief (Editorial), to finalize article line-up for upcoming issue and coordinating the dissemination of articles to copy editors. Editing of articles when necessary (i.e. Section Editor inability to complete tasks may require managing editor to step in and complete the work). Time Commitment: 4 hours/week; may increase prior to and during month of production; must attend all meetings. (More intensive during times of production). The Associate Editors will be responsible for editing all submissions assigned to them by the managing editor. Attend all Editorial related meetings organized by Managing Editor and Editor-in-Chief (Editorial). Organize appointments with writers as needed throughout the Editorial process. Strong knowledge of section area and ability to identify relevant, current and novel topics that fit within Juxtaposition’s mandate and objectives. Must be a team player and communicate effectively with staff members about copy. Time Commitment: 3 hours/week; may increase prior to and during month of production; must attend all meetings. (More intensive during times of production). Attend all general meetings as well as sponsorship, publicity and production meetings. Consolidate all meeting minutes and post them on Google groups, email to Executive team (Executive and Editorial staff) to keep abreast of Juxtaposition work and file for documentation in the Juxtaposition office. Be responsible for maintaining the listserv (ie. sending out call for writers, meeting dates and times and general information). Checking the Juxtaposition email account on a daily basis and sort and forward emails to appropriate staff members. Ensure office space and supplies are adequately maintained. Rectify all listserv, email and internet malfunction issues. Book rooms for meetings in a timely fashion. Time management, organizational, teamwork, communication and follow through strongly required. Time Commitment: 5-10 hours/week; may increase prior to and during month of production. At least one year previous work on the Toronto Thinks team or any conference planning executive team.